I was after a natural moisturiser and saw this on the shelf in my chemist. I think it's great how it absorbs quickly and doesn't leave residue on my skin. It's really light and leaves my skin feeling hydrated and smooth after using. I apply after after showering and cleansing and instantly feel moisturised. Greatest bodywash ever to use with our baby girl who has very sensitive skin! Thankyou for such a great product! I had a large, yellow white patch on my big toe nail two years ago and tried several products for many months with little effect. The toe nail eventually grew out and I was too scared to use nail polish again. A month ago the same thing happened. I stumbled across Fungistop at Changi Airport and thought I’d give it a try. I was absolutely amazed that within 3 day’s the yellowy patch had completely disappeared! I literally saw it reducing in size every time I looked. No waiting for the toe nail to grow out this time - it is looking pink and healthy. Edith, has had one toe fungus for 52 years. She has tried every product under the sun - and spoken to specialists about it. No one has been able to help her remove this fungus and she has not been able to wear nail polish on her toes. Edith is now on her second bottle of Dermal Therapy Fungistop -and her toe nail is finally 80% on the mend! She is THRILLED with the result and wanted to share her happy story! I love your product. The heels of my feet were in terrible shape. I started using [it] and immediately began to see results. I will recommend it to all of my friends. I just wanted to say thankyou for a wonderful product. I had painful deep fissures/cracks in my heels less than a week ago, and true to your product's claim which I have been using diligently twice a day, my feet are smooth as a baby's bottom. I will consider buying your hand cream now. Well done. It is the only cream I have ever used that doesn't make my feet greasy or other reactions. I also have noticed on your web page you have many other products which I am interested in. I absolutely loved it, what I liked was that it is a thick cream that quickly absorbs within the minute leaving it non greasy. My heels are usually cracked and dry, but after trialling Dermal Therapy Heel Balm it was a great product to use. I use it every day and night to keep my heels and feet non-cracked. I have been definitely recommending this to all my family and friends. Your heel balm works wonders! Since receiving your sample to test in the mail, my heels haven't been the same! The soft, gentle non greasy , moisturising cream made my heels incredibly soft and any signs of dry, cracked heels have completely disappeared and cracked heels are a thing of the past for me! I had awful dry, cracked and rough heels that were not only uncomfortable but looked horrible. I applied the Dermal Therapy Heel Balm nightly after my shower before bed and wore socks to prevent the balm getting on my sheets. The next day I could see and feel a difference already. My feet were already softer, by day four my feet were almost back to being normal, soft and smooth. I am so happy to have found a product so easy to use that delivers on its promise and actually does what it says it will. I will be sure to recommend this product to family and friends. After five nightly applications, my end of Summer dry heels have been transformed back to soft and smooth. No more embarrassment, thanks Dermal Therapy. I must say after a few days my heels weren't as sore from the cracks in them. Day 6 as in the pic was quite a significant recovery. I had splits in my heel really deep and they have closed up a fair bit. I’m very happy with the recovery of my heels and will keep using Dermal Therapy and see how my feet recover after a longer time. I’ve used it twice a day for 6 days and it’ss made my heels softer too. Thanks Dermal Therapy I can wear my nice sandals again! My husband and l both used your Heel Balm and noticed a difference overnight. The cracks in our feet were closing over in 12 hours literally! Cracks were gone, feet were not sore anymore, it really is a great product. l have never used anything that has worked so quickly and something that surprised was that there was no awful smell, unlike some of the creams we have been used in the past. 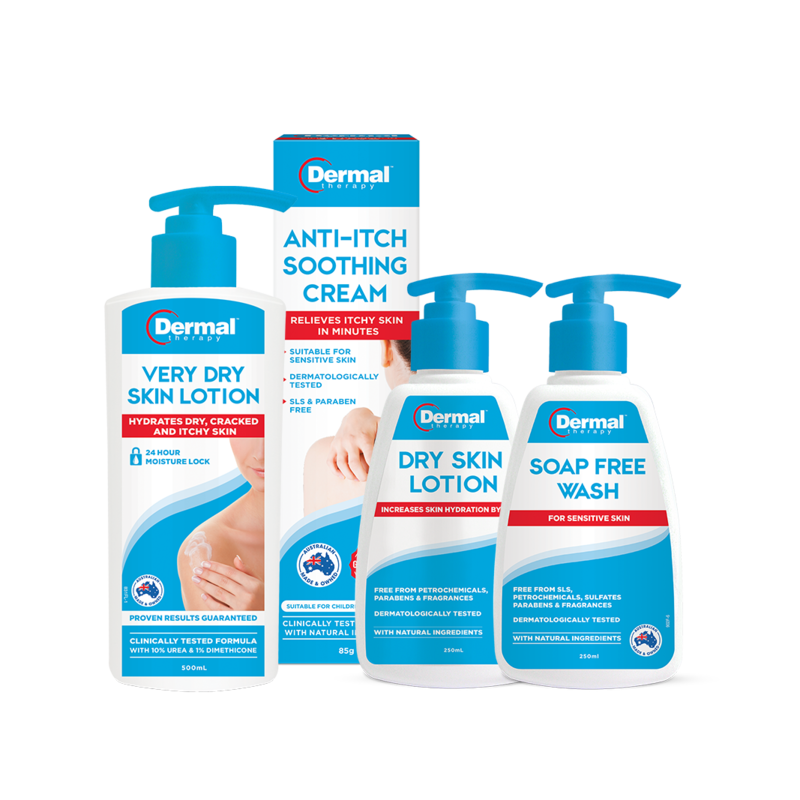 I suffer from eczema and this did not irritate my skin at all, so that was a huge bonus. l was bragging about this wonderful product to some friends today who are all older like me and have cracked heels, especially over summer, so they are going to purchase some too! Your Heel Balm works wonders! This gentle, non-greasy, moisturising cream made my heels incredibly soft and any signs of dry, cracked heels have completely disappeared. Cracked heels are a thing of the past for me! Thanks so much. I just started using Dermal Heel Magic few days ago, and am so in LOVE with it! It really works like MAGIC, and the results are immediate! My skin has softened, the peeling is gone and the cracks have become less obvious. I am so glad I bought this! THANK YOU SO MUCH for your wonderful product! Amazing.It really works. I have had the worst cracked heels for over 40yrs. They would bleed and be painful. My family were embarrassed at the sight of them. I've tried everything and nothing ever worked. I started this in June and felt immediate relief and now my cracks have gone altogether for the first time in memory. Plus, easy to apply..no greasy cream on hands or clothes. Fantastic. I am amazed! 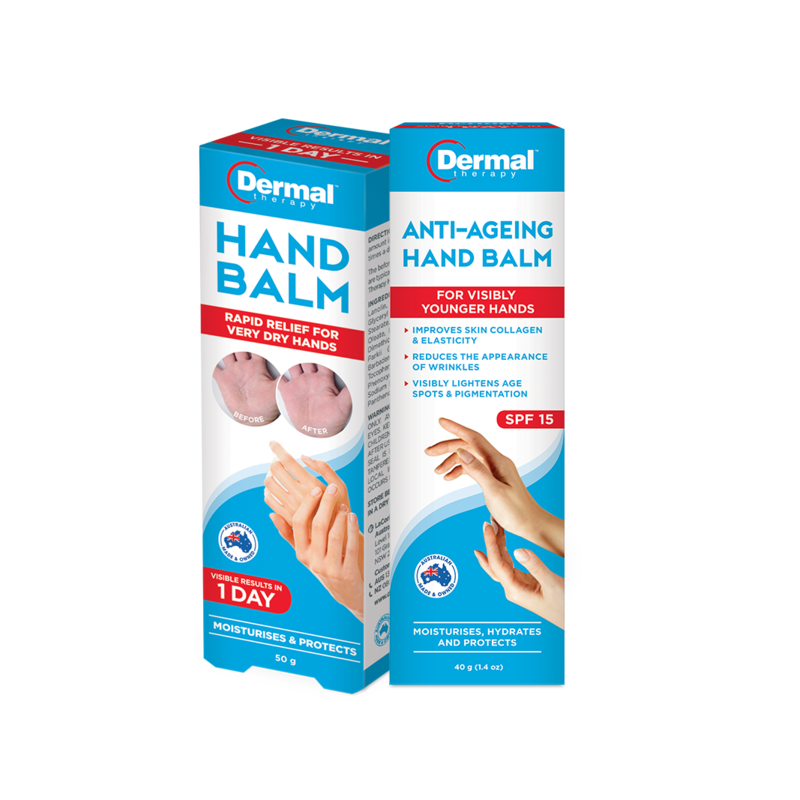 The Hand Balm did dramatically improve the skin on my hands, both the elasticity of the skin and the appearance of age spots from the very first use. I will be trying your other products in the near future. Their lip balm is amazing! Definitely visible results in 1 day! Thank you Dermal Therapy for a great product. I'm so glad I bought this from the April Beautorium 2016. 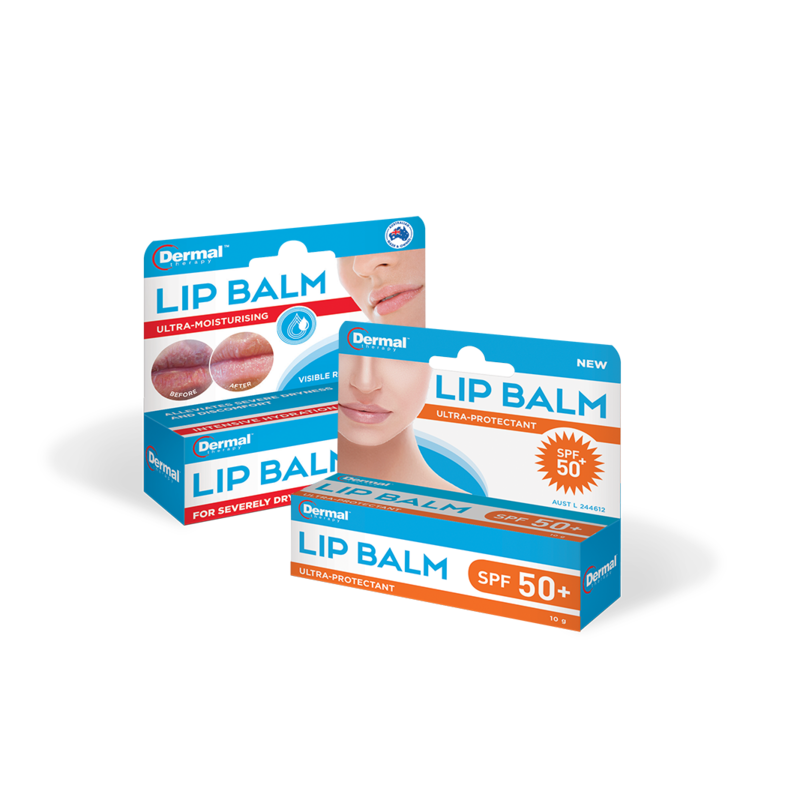 It's a clear lip balm that has a super silky smooth texture and feels great on. It has a touch of menthol-freshness which is what I like and reminds me of an old fave lip balm from back in the day when I was on Roaccutane and had a need for a excellent lip balm. Being clear I can utilise the fact that it has SPF50+ in it and rub it beyond my lipline too - to protect it from future unwanted sun-induced lip-lines. I love the very high SPF50+ because I'm outdoorsy and get out and about every single day - often in the sun but even on cloudy days they say that the UV rays are even stronger and more reflected! There is an easy-applicator tip which makes it easy to apply this hands and fingers free.